I purchase the adapter for road peddles and use the Eggbeater cleats with my Road bike. I like them because I can clip in quickly and they have lots of knee rotation. Best peddles and very light. Cornering clearance is very good. They last forever and you can re-grease them quickly. Can't go wrong. I'm a fan of the Crank Bros pedals. 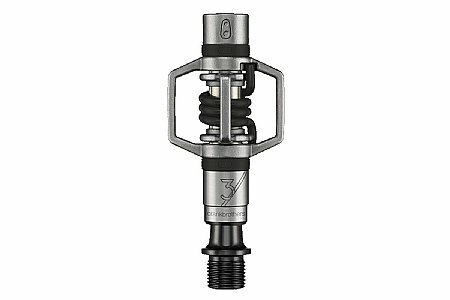 I use the Eggbeater 3s on all my bikes that use mtn bike pedals. They clear mud and snow easily, and the metal bodies hold up to abuse well. I rode a pair of Crank Bros. Candy pedals for many, many years. They were durable for sure and I loved the idea of the stability of the Candy platform. Still, I felt like the platform limited the number of entry points during a cross race (for example), so I opted for the Eggbeaters. These particular 'beaters are light weight and darn pretty. I consider it a facelift to the look of my crosser and so far I am digging them big time. Have a set of these on my mountain bike and both cyclocross bikes. Easy and fast for entry and exit. Shed mud, snow, and grime like nobody's business. Have heard people express concerns about the small contact patch to the shoe but with a stiff soled shoe it is not a problem. 2 pairs and love both strong clip in easily and out I use with sidi shoes and would not buy anything else! I switched from Speedplay Frogs (on my mountainbike and cyclocross) to Eggbeaters and have been very happy with both my mountain bike and cyclocross bike. It took a few times to get used to slightly different release point but I think it is easier to click out and jump over the barriers and click back in with the Eggbeaters. It seems like eggbeaters are under appreciated. They have an awesome warranty, they last forever regardless. They're lightweight, bombproof, and have excellent power transfer on the road and off the road. I dare say they're the perfect pedal. EB3 Pedals are right up there! The crank Bros design are one of my favorite and they tend to last a decent amount of time (2.5kyear) as long as you take care of them (rebuild every two, and oil regularly). Also, make sure you order extra cleats (like all brass cleats, they wear fast). They have a great amount of float and it is a welcome feature (IMHO) unlike other pedals that have made my knees hurt in the past with their limited yaw travel. These pedals are not the lightest but they are very tough (great price point vs. wear). Western was timely in their ship and a very good price. It is all about personal preference. but these pedals are pretty nuke proof to even include being the only thing I was able to salvage off my bike after I got hit by a car. They survived a couple of trips to the Utah desert where when you go down it is nothing but rock. And, as for mud clearance, if you can get your shoe out of the mud and find the pedal, you can click in.